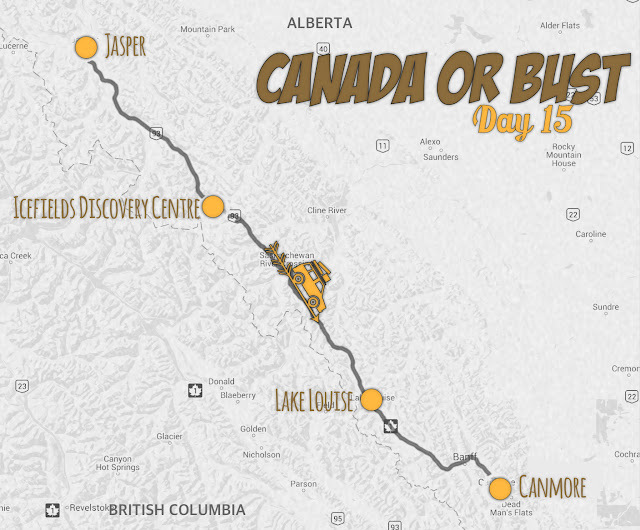 Day 15: Jasper, AB to Canmore, AB. Ah, Canada. We awoke to a bracing 28° this morning, reminding us of all we have to look forward to as the calendar moves toward the end of the year. 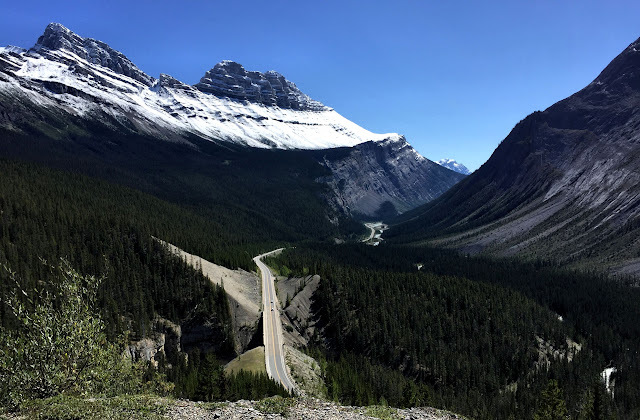 After topping off our fuel in expectation of limited services ahead, we turned south on the famous Icefields Parkway connecting Jasper and Banff National Parks. 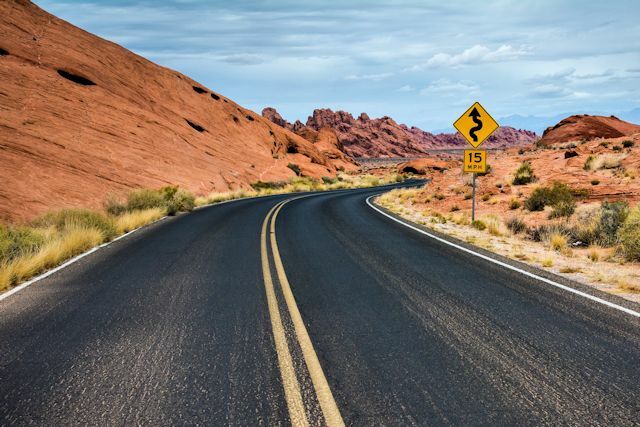 Ranked by some as one of the most spectacular scenic drives in the world, Highway 93 follows river valleys through the Rocky Mountains, providing access to twelve glacial ice fields. 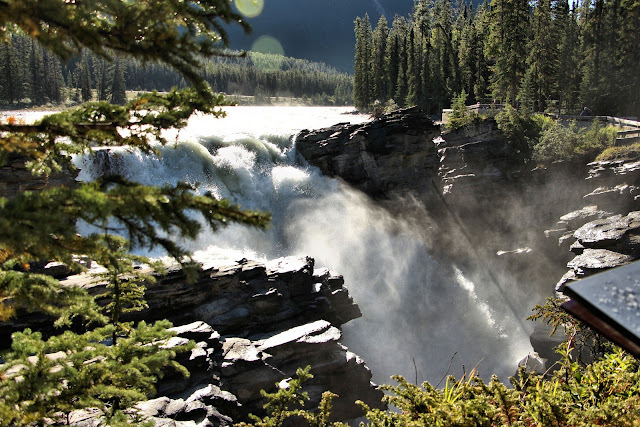 After a brief pause at the Athabasca Pass viewing area, our first stop was at Athabasca Falls, a thundering cascade plunging 75 feet, where an ancient glacier carved out a deep hollow below a quartzite ledge. A popular stop on the parkway, the falls area was busy with visitors, including a couple of tour buses. In contrast, just a few miles south, Sunwapta Falls, where a glacier moraine diverts the river of the same name from its northwesterly progression, was much quieter. 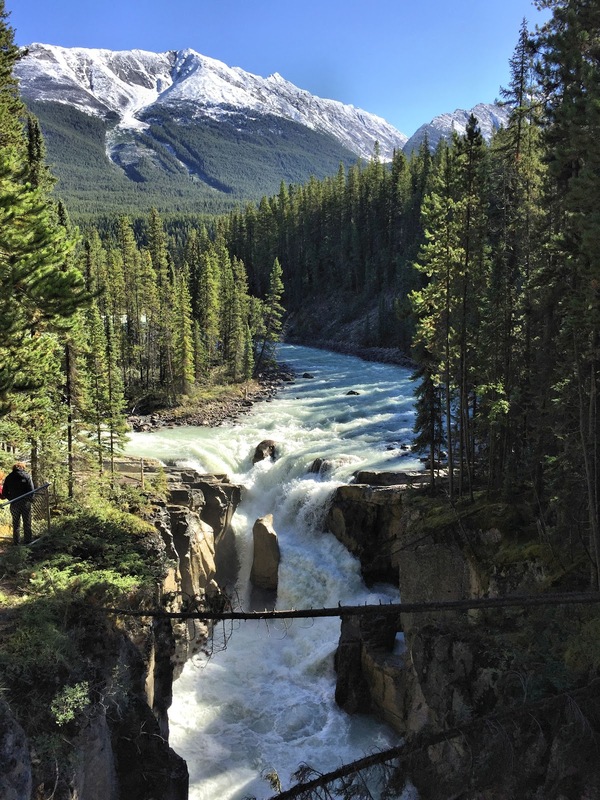 Fortunately we did not encounter the tourist we saw at the Athabasca Falls who leaned out over a railing above the falls with a two-year-old boy sitting on his shoulders. One squirm by the child would have spelled tragedy. Because of its position so far north on the continental divide, Jasper National Park—with five significant river systems—encompasses rivers whose waters drain to the Arctic, Pacific, and even Atlantic Oceans. South of the Sunwapta Falls, the road followed a long glacial outwash plain, previous home of a glacial lake. Soon we passed our first named glacier—Stutfield, a 3,600 ft. high cliff between two mountains. One of our goals today was visiting the Glacier Skywalk, a walkway running along the top of the Sunwapta Valley with a glass platform jutting out more than 900 feet over the cliff's edge. Fortunately, we passed it along the roadside before we had to make the commitment to try it. Rather than a remote location inaccessible except on the skywalk, it was located adjacent to the roadway, so there wasn't much except that frisson of walking out on glass above a deep canyon to distinguish it from the highway view. Thankful we had a preview of what to expect, we perused the Parcs Canada photography exhibit when we stopped at the Columbia Icefields Discovery Center rather than getting in the long line to buy $30 tickets for the Icewalk or the $55 opportunity to ride a large-tire bus onto Athabasca Glacier. Set about midway along the parkway between Jasper and Banff, the visitor center offers views of some of the major mountain peaks of the Columbia ice field. 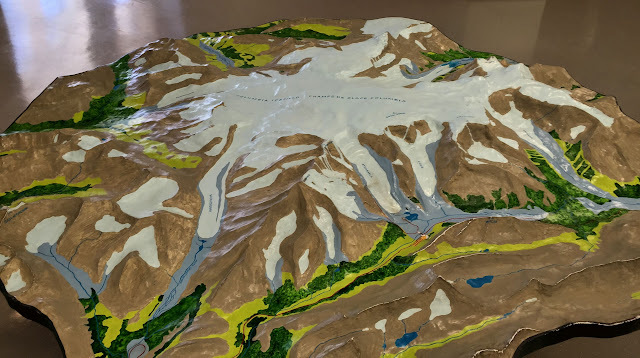 An ice field is a body of ice at a high elevation from which glaciers flow in multiple directions. From the ice field rim at the top of the glacier, the Athabasca descends almost 3,000 feet to the valley floor. 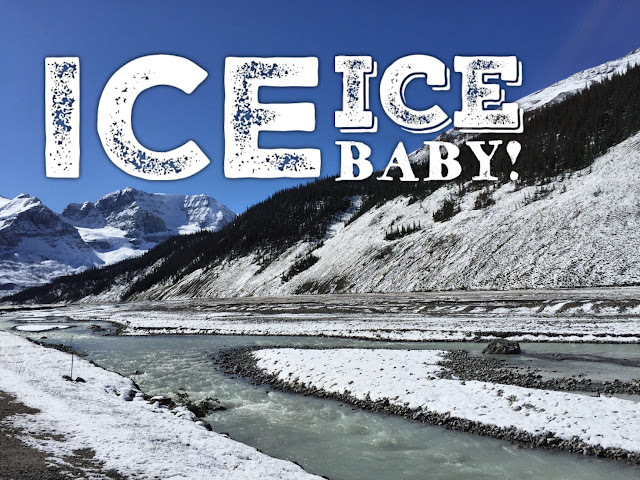 The original Icefields Parkway was a monumental make-work project devised to employ Canadians during the Great Depression. Horses, plows and other primitive equipment were used to forge the gravel road through this rugged terrain. Just a few miles south of the center, we crossed the boundary from Jasper into Banff National Park. As in Jasper, we continued driving through forested valleys encircled by massive, craggy snow-capped peaks. 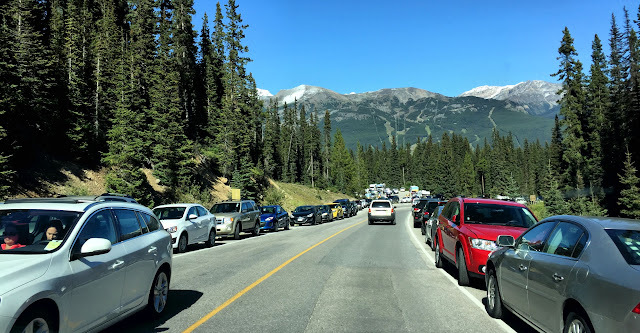 Traffic had definitely been building as we moved deeper into Banff, by far the more popular of the two parks with almost twice the annual attendance of the Jasper park. After summitting Bow Pass at 6,785 feet, we stopped to visit the pristine Bow Lake, created when rubble left by the retreat of a prehistoric glacier dammed up the Bow River. 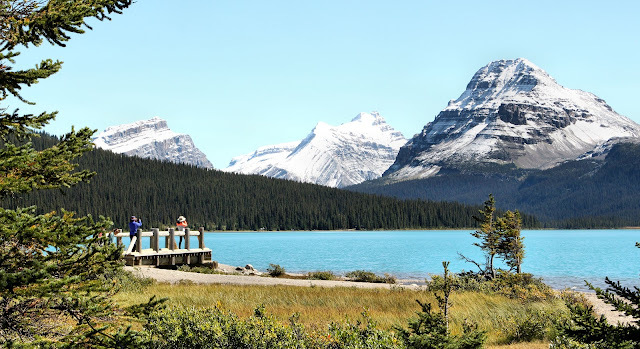 One of the largest lakes in Banff, Bow's turquoise waters come almost exclusively from Bow Glacier melt. 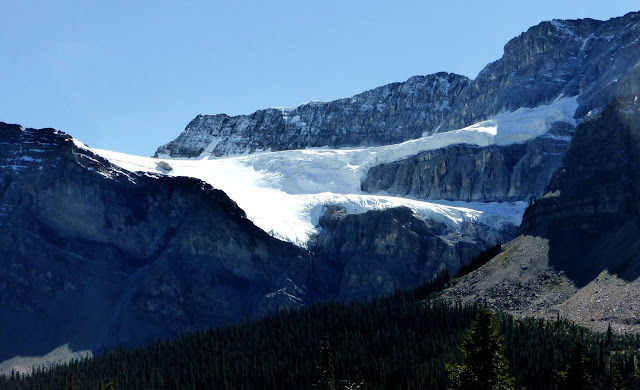 As its name suggests, Crowfoot Glacier split into three paths as it flowed toward the cliff edge. To make sure we caught the name, as we pulled into the parking lot for the lookout, two ravens were stirring up a racket as they clomped around looking for handouts. Around 3:30, we reached Lake Louise, which was insanely busy. Cars were parked bumper to bumper on the road shoulders a mile and a half before we reached the legendary Fairmont Hotel sitting on the lakeshore. At first we thought there was a festival or some other special event underway, but we were wrong. 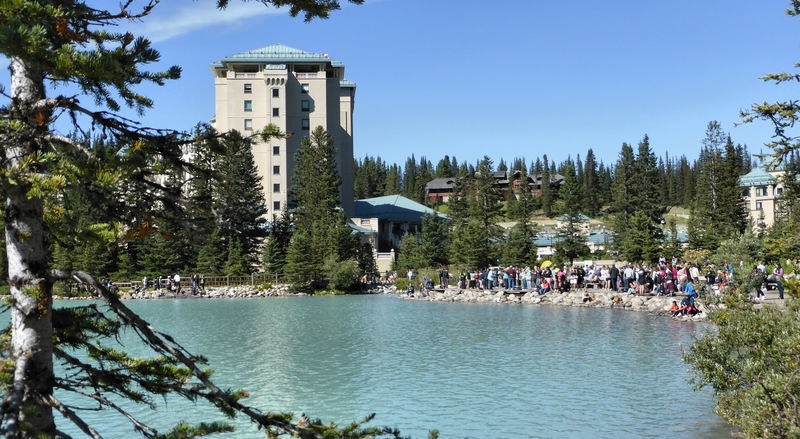 It was the norm for summer in Lake Louise. Though flashing signs on the approach road through the village warned "Parking Full," we were not inclined to park at the first available roadside and hike up the middle of a busy road more than a mile. Plus we figured the cars coming from the lake area had to be vacating some parking spaces, eh? Sure enough, we easily found a spot in a parking lot adjacent to the lake. Of course, by the time we parked, we knew what to expect. Tempted as we were to just leave and continue south, we forced ourselves to walk to the very crowded shore of the lake, where we took a few photos of a lake whose natural beauty was no better than the quiet Bow Lake we had seen earlier. Yet thousands of people seemed to be thrilled to be there marveling over what they considered the unrivaled beauty of Lake Louise. 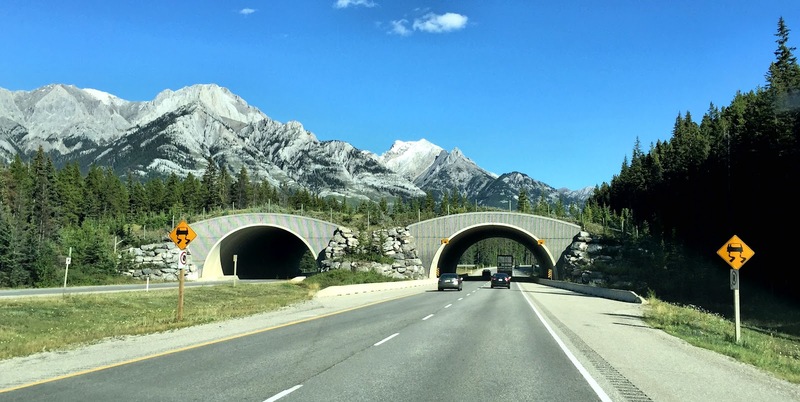 In the more populated areas of Banff National Park, as we drove south, we began seeing wildlife overpasses. Along the roadsides, eight-foot fences twenty yards from the shoulders cut down on road kill. The overpasses, also fenced, permit animals to move safely from one part of their habitat to another, even though it's bisected by a busy highway. Rather than staying in the congested town of Banff, we drove a bit further south and checked into a one-bedroom condo at Stonebridge Mountain Resort in Canmore. After stocking up with groceries at the local Safeway, we moved into our spacious lodging and prepared dinner, looking forward to taking a day off tomorrow.